The AMC Matador is an automobile model line built and marketed by American Motors Corporation (AMC) from 1971 to 1978. The Matador came in two generations: 1971 to 1973, and a major redesign from 1974 to 1978. The second-generation four-door sedan and station wagon models were classified as full-size cars and did not share the distinctive styling of the Matador coupe that was introduced in 1974. Factory-backed AMC Matador hardtops and coupes competed in NASCAR stock car racing with drivers that included Mark Donohue and Bobby Allison winning several races. The new Matador coupe was featured in The Man with the Golden Gun, a James Bond film released in 1974. Matadors were a popular vehicle for police, as they outperformed most other police cars. They were also featured in many television shows and movies during the 1970s. The Matador became AMC's largest automobile following the discontinuation of its flagship, the AMC Ambassador, built on the same platform. Premium trim "Oleg Cassini" and "Barcelona" versions of the Matador coupe were positioned in the personal luxury car market segment. Matadors were also marketed under the Rambler marque in foreign markets, as well as assembled under license agreements with AMC that included Vehículos Automotores Mexicanos (VAM), as well as built in right-hand-drive versions by Australian Motor Industries (AMI). The Matador replaced the AMC Rebel, which had been marketed since 1967. With a facelift and a new name, the AMC Matadors were available as a two-door hardtop as well as a four-door sedan and station wagon. The Matador was based on AMC's "senior" automobile platform shared with the full-size Ambassador line. The sedan and wagon models "offered excellent value and were fairly popular", including as a prowl car. Matadors were offered to fleet buyers with various police, taxicab, and other heavy-duty packages. Government agencies, military units, and police departments in the U.S. equipped Matador sedans and wagons with 360 cu in (5.9 L) or 401 cu in (6.6 L) V8 engines. The Matador received a redesign in 1974, in part to meet new safety and crash requirements, as well as a completely different model "to contend with the bull market for plush mid-size coupes that sprang up after the end of the muscle car era". American Motors advertising assured that the new Matador was not just a name change and facelift, but in reality it was the 1970 Rebel restyled with a longer front clip. The 1971 model year Matadors acquired a more substantial front end look for all three body designs: two-door hardtop, four-door sedan, and station wagon. The AMC Matador shared its basic body design from the firewall back with the Ambassador, which was built on the same platform, but had a longer wheelbase and front-end sheetmetal, a formal grille and luxurious trim, as well as more standard equipment that included air conditioning. Externally the 1971 model retained the same trunk lid chrome strip and rear-corner chrome garnishes as the 1970 Rebel. The rear bumper was also the same as the 1970 Rebel but with a new tail light lens assembly of three-in-line square lenses with rounded corners. Interior wise, it shared the same dash, instrument cluster, steering wheel, and arm rests as the 1970 Rebel. Also reused was the 1967–1970 Rebel "Weather Eye" fan-heat control unit. The 1971 model came with a split-bench front seat with individual fold-down center arm rests for passenger and driver seats. While "Matador" may have been a move away from connotations of the Confederacy inspired by the rise of the civil rights movement, it did not help solve the obscurity problem, as AMC adopted a "what's a Matador" advertising campaign. This self-disparaging marketing campaign "turned the styling of anonymity into an asset." Consumer-research polls conducted by AMC found it meant virility and excitement to consumers. However, American Motors ran into problems in Puerto Rico, where "matador" has connotations of "killer" on the island where bullfighting was abolished when the U.S. took its control. The Matador station wagons had available rear-facing third-row bench seats, increasing total seating from six to eight passengers. In addition, all wagons included roof racks and two-way tailgates that opened when the rear windows were down either from the top to serve as an extended flat surface that was even with the load floor, or to swing open like a regular door hinged on the left side. The Matador came with a straight-6 or a number of V8 engines. Transmissions for the Matador included the Borg-Warner sourced "Shift-Command" three-speed automatic, a column-shifted three-speed manual and a floor-shifted four-speed manual. Continuing in the muscle car market segment, the "Machine" was moved from being a distinct 1970 AMC Rebel model to the new Matador only as a performance package option for two-door hardtops. However, the options could also be ordered individually making it possible to equip the equivalent of a "Go Package" on a four-door Matador sedan or station wagon. The 1971 "Go Package" Matador two-door lacked the optional bold red, white, and blue striping of its AMC Rebel-based predecessor, and also had no special identification or badging. Less known than the 1970 original, around 50 Matador Machines were produced for 1971. The package featured 15 × 7-inch slot-styled steel wheels with white-lettered "polyglass" belted tires, dual exhaust system, a heavy-duty handling package, power disk brakes, and a choice of either a 360 cu in (5.9 L) ($373 option) or the 401 cu in (6.6 L) V8 engine (for $461) with either a four-speed manual or a three-speed automatic transmission. In 1972 the innovative AMC Buyer Protection Plan was introduced. This was the automobile industry's first 12-month or 12,000 miles (19,312 km) bumper-to-bumper warranty. American Motors started with an emphasis on quality and durability by focusing on its component sourcing, improving production that included reducing the number of models, as well mechanical upgrades and increasing the level of standard equipment. This was followed by an innovative promise to its customers to repair anything wrong with the car (except for tires). Owners were provided with a toll-free number to the company, as well as a free loaner car if a warranty repair took overnight. The objective was to reduce warranty claims, as well as achieve better public relations along with greater customer satisfaction and loyalty. The previous Borg-Warner sourced "Shift-Command" three-speed automatic transmission was replaced by the Chrysler Corporation-built TorqueFlite three-speed automatic that AMC marketed as "Torque-Command." The column-shift three-speed manual continued as the standard transmission, but the optional four-speed manual was discontinued. Externally the 1972 model was the same as the 1971 model, retaining the same front end but with 3 vertical strips added to the grille. The chrome trunk lid strip and rear corner chrome of the 1970 Rebel and 1971 Matador was dropped. The 1972 model was given a new tail light lens assembly with each assembly divided into nine recessed vertically rectangular lenses. Interior-wise the 1972 model saw the return of the round instrument dials of earlier Ambassador and 1967 Rebel models. The steering wheel was the same as the 1970 Rebel and 1971 Matador models. New for the 1972 model was slimmer arm rests for the doors and a bench seat without the fold-down centre armrests. Matador hardtop, sedan, and station wagon body styles came in only one trim model for 1973, with numerous appearance and comfort options. The 1973 model year brought new U.S. National Highway Traffic Safety Administration (NHTSA) regulations that required all passenger cars to withstand a 5-mile-per-hour (8 km/h) front and a 2.5-mile-per-hour (4 km/h) rear impacts without damage to the engine, lights, and safety equipment. Matadors gained stronger front and rear bumpers. The front bumper included self-restoring telescoping shock-absorbers and more prominent vertical rubber guards, while the rear bumper gained vertical black rubber bumper guards that replaced a pair of similar and previously optional chrome bumper guards. Aside from the changes to the bumpers, the design of the 1973 model was identical to the 1972 model with the exception of new tail light lens assemblies and a slightly different grille pattern. The full-width bench seat was standard with 50/50 individually adjustable and reclining seats were optional on all body styles. The station wagons came with "Uganda" vinyl upholstery, while the two-door hardtops offered optional front bucket seats. All V8 powered Matadors came with a TorqueFlite 998 automatic transmission and a column-mounted automatic shifter. The 232 cu in (3.8 L) I6 was the base engine with a column-mounted three-speed manual transmission, with a 258 cu in (4.2 L) I6 optional, with which only the station wagon could be ordered with a manual transmission because almost all six-cylinder powered Matadors came with TorqueFlite 904 automatics. Marketing of the Matador included NASCAR appearances. Mark Donahue drove a two-door hardtop prepared by Roger Penske on the road course at Riverside, California, in January 21, 1973, lapping the entire field to win this NASCAR Cup Series race This was also Penske's first NASCAR victory at the Winston Western 500, with Donahue's Matador leading 138 out of the 191 laps. The intermediate-sized car market segment was growing to almost 20% of the total market by 1973, but the hardtop was the slowest-selling version in the Matador line, "in a segment where two-door hardtops were customarily the most popular (and profitable) models." Automobile Quarterly reviewed the 1973 cars and summarized that "AMC actually has a very strong product line, but public awareness of it seems so feeble as to be negligible. ... The Matador became a typical intermediate, an exact counterpart of the Satellite/Coronet or Torino/Montego", and ranked AMC's car as a "good buy." A major design change was introduced with the 1974 models for both the sedan and wagon, while the two-door became a separate and radically styled hardtop coupe. These could be considered the "second generation" Matadors. New passenger car requirements set by NHTSA called for the front and rear passenger car bumpers to have uniform heights, take angle impacts, and sustain 5-mile-per-hour (8 km/h) impacts with no damage. The 1974 AMC Matadors accomplished this with massive bumpers. The four-door sedans and wagons received a new front fascia with a hood and grille featuring a prominent central protrusion that followed the front bumper shape. Matadors with this front fascia are sometimes nicknamed "coffin noses". Second generation sedans and station wagons continued over all the model years with only minor trim and equipment changes. Engine options for the 1974 model included AMC's 232 cubic inch inline six-cylinder or a no-cost upgrade 304 cubic inch V-8. Buyers could also opt for a two-barrel or four-barrel 360 cubic inch V-8, or the ultimate 401 cubic inch V-8 with single or dual exhaust. Standard transmission was a three-speed manual with column shift, but more popular was the three-speed Torque-Command automatic. A floor shift automatic transmission was available only on the coupe with center console and bucket front seats. The 232 cu in (3.8 L) I6 was only available for the 1974 models, except in California. The 401 cu in (6.6 L) V8 was a fleet-only option after 1974. A road test by automobile journalist Vincent Courtenay of the 1974 Matador station wagon "praised its performance, handling, and fuel economy considering its size and 360 CID engine." He described it as "a real sleeper on the market. Its performance ranks it in the first line of cars, yet it's reasonably priced." Changes for the 1975 model year were minor as AMC focused on the development and introduction of its innovative Pacer, but Matadors now included a standard "no maintenance" electronic ignition developed by Prestolite. All U.S. market Matadors featured catalytic converters that required the use of unleaded regular-grade fuel. New "unleaded fuel only" decals were placed by the fuel filler door and on the fuel gauge. Steel-belted radial tires became standard equipment on all Matadors. The base six-cylinder engine was enlarged to 258 cubic inches, and the V-8 options for the public became the 304 and 360. The 401 cu in V-8 was available only for police cars. Only V8-powered Matadors were available in California. Style-wise, the Matador received a new full-width grille, new squared off turn signals embedded in the grille, and a new tail light lens assembly. There were no further style changes to the body of the sedan and wagon for the remainder of the production run. The "Power Package" 360 cu in (5.9 L) V8 (4-barrel carburetor and dual exhaust with twin catalytic converters) was available through 1976. For 1977 AMC introduced the Buyer Protection Plan II which extended the engine and drivetrain warranty from 12-months/12,000 miles to 24-months/24,000 miles. The base engine continued to be the 258 cubic-inch six cylinder and V-8 options were the 304 or 360 cubic-inch. The high-performance "Power Package" 360 was dropped for 1977. All Matadors came standard with automatic transmission which was continued for 1978. For 1978, the 258-cubic-inch six remained standard, but the 360-cubic-inch became the only V-8 option. American Motors' executives saw an opportunity to replace the "uninspired" Matador two-door hardtop with a new design to capture people looking for exciting, sporty styling in a market segment that was outpacing the rest of the automobile market; and were looking to answer the demand for plush mid-size coupes after the end of the muscle car era. The 1974 model year introduced an aerodynamically styled fastback coupe with pronounced "tunneled" headlight surrounds. The Matador coupe was the only all-new model in the popular mid-size car segment, specifically targeting the Chevrolet Chevelle Coupe, Ford Torino Coupe and Plymouth Satellite Sebring. The coupe was designed under the direction of AMC's vice president of styling, Richard A. Teague, with input from Mark Donohue, the famous race car driver. AMC's styling department had greater freedom because of a decision to design the new Matador strictly as a coupe, without the constraints of attempting to have the sedan and station wagon versions fit the same body lines. Reportedly Teague designed the coupe's front as an homage to one of the first AMCs he designed, the 1964 Rambler American. Many were amazed that AMC came up with the fast, stylish Matador, considering the automaker's size and limited resources. The coupe's wind-shaped look was enhanced by a very long hood and a short rear deck. The Matador coupe stands out as one of the more distinctive and controversial designs of the 1970s after the AMC Pacer and was named "Best Styled Car of 1974" by the editors of Car and Driver magazine. A Popular Mechanics survey indicated "luscious looks of Matador coupe swept most owners off their feet" with a "specific like" listed by 63.7% of them for "styling". Sales of the coupe were brisk with 62,629 Matador coupes delivered for its introductory year (August 1973 thru December 1974, Long Year), up sharply from the 7,067 Matador hardtops sold in 1973. This is a respectable record that went against the drop in the overall market during 1974 and the decline in popularity of intermediate-sized coupes after the 1973 oil crisis. After it outsold the four-door Matadors by nearly 25,000 units in 1974, sales dropped to less than 10,000 in 1977, and then down to just 2,006 in the coupe's final year. Nearly 100,000 Matador coupes in total were produced from 1974 through 1978. American Motors executives, including vice president of design Richard A. Teague, described design plans for a four-door sedan and station wagon based on the coupe's styling themes that did not reach production. A special Oleg Cassini edition of the Matador coupe was available for the 1974 and 1975 model years. This was following a recent tradition of Designer cars by AMC, the Gucci Hornet and Pierre Cardin Javelin were previously done. American Motors had the famous American fashion designer develop a more elegant luxury oriented model for the new coupe. Cassini was renowned in Hollywood and high-society for making elegant ready-to-wear dresses, including those worn by Jacqueline Kennedy. Cassini himself helped promote the car in AMC's advertising. With Cassini's styling, the new "smooth and slippery" two-door featured "marks of haute couture" with the "upholstery, panels and headliner done in jet black, with copper trim pieces, and with carpets and vinyl roof also offered in a copper accent color. The exterior trim included striping, rub rails, wheel covers and special "Oleg Cassini" crest badging mark the Matador as Cassini's." The Cassini Coupes were limited to black, white, or copper metallic exterior paints, and all came with the vinyl-covered roof. They also featured copper-colored trim in the grille, headlamp bezels, in turbine-type full wheel covers, and within the rear license plate recess. The interior was a Cassini hallmark featuring a special black fabric with copper metal buttons on the individual adjustable and reclining front seats and on the padded door panels, that was set off by extra thick copper carpeting. Additional copper accents were on the steering wheel, door pulls, and on the instrument panel. Embroidered Cassini medallions were featured on the headrests. The glove compartment door, trunk lid, front fender, and hood featured Cassini's signature. The use of a fashion designer to specially create appearance packages for American cars was taken up by the Continental Mark IV in 1976. In 1979, Cadillac briefly used this approach on the Cadillac Seville partnering with fashion designer Gucci but ended this practice in 1980. For 1977 and 1978, the "Barcelona II" coupe featured a padded Landau roof and opera windows, styling cues that were required at that time by buyers in the highly popular two-door "personal luxury" market segment. At first, it was available in only one distinctive two-tone paint pattern consisting of Golden Ginger Metallic with Sand Tan. The Barcelona included numerous comfort and appearance upgrades in addition to the extensive standard equipment that came on all Matadors. The special items were: individual reclining seats in velveteen crush fabric with woven accent stripes, custom door trim panels, unique headliner, headlight bezels painted accent color, black trunk carpet, rear sway bar, GR78x15 radial whitewall tires, color-keyed slot styled wheels, body color front and rear bumpers, two-tone paint, landau padded vinyl roof, opera quarter windows with accents, dual remote control mirrors painted body color, Barcelona medallion on glove box door and fenders, 24 oz (680 g) carpeting and bumper nerf strips. The standard roll-down rear quarter windows were converted into fixed "opera windows" with fiberglass covers over the stock openings that were finished with padded vinyl inside and out. For the 1978 model year, the Barcelona came in a second color scheme: an Autumn Red Metallic on Claret Metallic combination. For its final production in 1978, the Barcelona model was also available on the four-door sedan body style. The 258-cubic-inch six with automatic remained standard, but the 360-cubic-inch became the only V-8 option. Production for this final year was 2,006 coupes. Motor Trend magazine road tested a 1977 Barcelona II coupe and found it to be equal to all in the objective areas, as well as one of the most distinctive vehicles on the road that "makes a good deal of sense... if you're not put off by the Matador's unique lines." Penske Racing prepared factory-backed Matador hardtops and coupes were used in NASCAR stock car tracks. Drivers included Indy winner Mark Donohue and Bobby Allison, and they won a number of races. As it was AMC's first entry into NASCAR since the Hudson Hornet of predecessor company Hudson, the company's effort "raised eyebrows" for many NASCAR veterans because AMC was not known for cultivating a racing image. Racing pundits "initially scoffed at the notion of an AMC entry" on the circuit, but "the Matador acquired a fan following of its own." Hutcherson-Pagan built a pair of 1972 2-door hardtop "Bull Fighters" for Penske as the marque's first attempt at NASCAR in 1972. The Matador was one of the first oval stock car to use disc brakes. After Donohue won the Western 500 with the first-generation Matador hardtop with four wheel discs, other teams soon followed with the upgrade. Bobby Allison also won the non-points Daytona 125 qualifying race on 13 February 1975 and finished second in the Daytona 500 three days later. Following the discontinuation of the Matador in 1978, AMC would not field another entry in NASCAR until its purchase by Chrysler in 1987. (Chrysler was itself from a hiatus from NASCAR at the time.) The Matador would also be NASCAR's sole entry that was not from Detroit's Big Three following MG's withdrawal in 1963 to Toyota's entry in 2007. Though the full-sized AMC Ambassador was also offered as a police car, the Matador would prove to be very popular. The largest user of Matador patrol cars was the Los Angeles Police Department (LAPD), primarily from 1972 to 1974, with some staying in service until the mid-1980s. After extensive testing of the special police models offered by Chevy, Ford, and Chrysler, the LAPD chose the AMC Matador because they "out handled and outperformed all the other cars." The LAPD police Matadors included among other special equipment: T-2 can lights, a five-channel Motorola Motrac 70 radio, a Federal siren, and a "Hot Sheet Desk" with a Roster gooseneck lamp. Matador sedans and station wagons were also used by other agencies, including the Los Angeles Sheriffs Department and many other law enforcement agencies across the U.S. and Canada, as well as by military police units. While V8 power was down for many domestic sedans, AMC used a 401 cu in (6.6 L) V8 engine that out powered most other police vehicles. Tests of the 1972 AMC Javelin pony car and Matador sedan equipped with the 401 V8s resulted both running the quarter-mile dragstrip in the 14.7-second range. 0 to 60 mph (97 km/h) times were within 7 seconds, comparable to a 2006 Hemi Charger police car. Top speed was about 125 mph (201 km/h), which took 43 seconds, much faster than the previously used Plymouth Satellites. The 1974 models would be the last year for the LAPD's purchase of the Matador. The second-generation longer-nosed restyle and the 5-mile bumpers added weight that affected handling and performance. Moreover, after 1976, AMC "let the police car business go as it causes too many problems." AMC Matador police cars would appear in many television shows during the 1970s, most famously in Adam-12 from 1972 until the show's end in 1975. As part of a significant product placement strategy, an AMC Matador coupe played a starring role in a The Man with the Golden Gun, released in 1974. It featured the newly introduced Matador Brougham Coupe in the Oleg Cassini edition, along with Matador four-door police cars (in the black and white livery used by the Los Angeles Police Department) and a Hornet X hatchback. The Matador is the car of Francisco Scaramanga, and along with Nick Nack, they use the "flying" AMC Matador to kidnap Mary Goodnight. The machine was 9.15 m (30 ft) long, 12.80 m (42 ft) wide, and 3.08 m (10 ft) high. A stuntman drove the "car plane" to a runway. It was not airworthy, so a 1 m (39 in)-long remote controlled model, built by John Stears, was used for the aerial sequences. The "flying AMC Matador" was exhibited at auto shows, part of AMC's marketing efforts for the aerodynamically designed coupe, as well as publicity exposure for the concept of unique flying machines. Australian assembly of the Matador by Australian Motor Industries (AMI) started in 1971, and the model was discontinued after 1977. The AMI cars were marketed as the Rambler Matador. Starting in late 1971, the AMI-built Matador was available in sedan and wagon body styles. Standard equipment included automatic transmission, power steering, power windows, air conditioning, and an AM radio. The engine was AMC's 360 cu in (5.9 L) V8, following its introduction in the 1970 Rebel. Among the options were an exterior mounted sun visor, vinyl roof cover, tow hitch, and mud flaps. The cars were targeted at the top market segment and advertised as "the American luxury limousine made for Australians" and built for Australian conditions. Knock-down kits for right-hand drive models were shipped from AMC's Kenosha, Wisconsin factory for assembly in AMI's facilities in Port Melbourne, Victoria. AMI used the same paint codes for the Matadors as the Toyota and Triumph vehicles they also assembled. These paint codes did not correspond to the AMC paint codes and thus Australian Matador colours are unique. In addition to the modifications needed for Australian standards and market requirements, changes included the use of "local content" sourced parts and components (such as seats, carpeting, lights, wing mirrors, heaters, and even unique "R"-logo wheel covers) that reduced the tariff added to each car. As with the previous Rebel models all AMI-assembled Matadors continued to use the dash and instrument dials of the U.S. 1967 Rambler Ambassador. Seating for the 1971-1972 models consisted of a full bench seat with fold-down centre armrests for both front and rear seats with headrests for the front. For 1973 the front seat became a split-bench seat, each with its own fold-down armrest. As red rear flashers were prohibited in Australia, amber-coloured trailer lights were retrofitted to the rear of all AMI-assembled Matadors, drilled into the tail gate of the station wagons or mounted over or behind the reversing lens of the tail light assembly of the sedans, and then re wired so the turn signals would flash orange. AMI continued to assemble the 1973 Matador throughout 1974 and 1975. Australian Motor Industries held over assembling the second-generation Matador sedan and wagon until the end of 1975 with the greatest number assembled in 1976. A smaller number were marketed through 1977. AMI assembled only the U.S 1974 model during this time. All Australian second-generation Matadors were powered with the AMC 360 V8 engine with automatic transmission. As with the previous models, the 1967 Ambassador dash assembly was reused, now with the 1974 U.S. Matador instrument cluster and a new cluster surround. Starting with the 1973 first-generation Matador, AMI replaced the 1967 U.S Ambassador passenger dash pad that had been in use since the Rebel, with a more protruding dash pad that ran flush with the instrument cluster binnacle. The Australian-made split-bench seats and door cards from the last of the first generation Matadors remained unchanged, but the revised steering wheel of the U.S. 1974 model was used on Australian models till production end. To meet the requirement of amber rear turn indicators, Australian models used the 1974 tail light assembly with the clear lens replaced with an amber lens. The U.S 1975-1978 revised sedan tail light assembly was not used in Australia. A total of 145 Matadors (118 sedans, 27 wagons) were sold in Australia during 1974. All were first generation 1973 models. Registrations for 1975 were 118 Matadors (85 sedans, 33 wagons) including the first of the second generation models assembled at the end of 1975. In 1976 there were 88 Matadors (78 sedans, 10 wagons), and in 1977 there were 27 Matadors (24 sedans and 3 wagons). The second-generation Matador Coupe version was assembled by AMI in limited quantity in 1976 in only its 1974 model year version but was held over until 1977 whereupon it was sold for one year only. As with all RHD export and local assembled Rebel and Matador sedans and wagons, the Australian Matador coupe used the dash of the 1967 Rambler Ambassador, although the instrument dials, center column, and steering wheel were from the U.S. model. U.S.-built Matadors were exported to several European countries. The AMC Rebel was assembled by Renault at their Belgium plant until 1967. The subsequent Matador model was not assembled, instead the AMC-Renault partnership ultimately led to Renault taking control of AMC in 1979 and using the AMC facilities to build Renault cars for the U.S market until Renault sold AMC to Chrysler in 1987. Matadors were built by Vehículos Automotores Mexicanos (VAM) in Mexico. Continuing the concept of VAM's version of the AMC Rebel, the Mexican Matadors were only available as a single trim level and in four-door sedan and two-door hardtop forms in their initial year. The hardtop retained the Rambler Classic SST name while the four-door sedan changed from Rambler Classic 770 to Rambler Classic DPL. Both body styles saw the same features as the 1971 AMC Matadors and were almost equal with only few exclusive characteristics for each. Standard equipment consisted of four-wheel manual drum bakes, manual steering, 170 bhp (127 kW; 172 PS) gross at 4,600 rpm 252 cu in (4.1 L) I6 engine with Carter WCD two-barrel carburetor and 9.5:1 compression ratio, fully synchronized three-speed manual transmission with column shift, 10-in heavy duty clutch, 3.54:1 rear differential gear ratio with manual transmission, 3.07:1 rear differential gear ratio with automatic transmission, electric two-speed wipers, electric washers, rectangular full-length 200 km/h (120 mph) speedometer, electric analog clock, collapsible steering column with built-in ignition switch, luxury custom steering wheel, courtesy lights, cigarette lighter, dashboard ashtray, locking glove box, wide individual front seats (hardtop), front bench seat (sedan), two-point front seatbelts, front and rear side armrests, dual rear ashtrays, single round dome light (sedan), dual C-pillar dome lights (hardtop), dual coat hooks, bright molding package, luxury wheel covers, and driver's side remote mirror. Optional equipment included power drum brakes (standard with automatic transmission), power steering, heavy-duty suspension, automatic transmission, heater with front defroster, vinyl roof, remote-controlled driver's side mirror, passenger's side remote mirror, bumper guards, bumper tubes, and locking gas cap. For 1972, all VAM cars received the same revisions and improvements of the AMC models. The Classic line saw upgrades in the replacement of the 252 cu in (4.1 L) six in favor of the 282 cu in (4.6 L) with gross 200 bhp (149 kW; 203 PS) at 4,400 rpm with Carter ABD two-barrel carburetor, 9.5 compression ratio, and 266 degree camshaft. Power brakes with front disks became standard equipment regardless of transmission, a Chrysler A998 three-speed automatic transmission in place of the older Borg-Warner automatics, heavy-duty suspension with front sway bar, improved heater with revised controls placed to the right of the steering column, and new two-round-pod instrument cluster. New wheel cover and grille designs were noticeable on the exterior, while seat patterns and side panels were also updated. Since its redesign in 1970, the hardtop body style started to drop in sales and the front end facelift of 1971 did not help to reverse the trend. VAM did not want to drop it leaving it without a mid-sized two-door. The model was reworked into an all-new limited edition with a sportier focus for 1972, as well as featuring more appointments similar to a personal luxury car. This became the VAM Classic Brougham, with the name "Rambler" removed to rejuvenate the line, while the four-door sedan became the VAM Classic DPL. The Brougham included as standard equipment power steering, three-speed automatic transmission with floor-mounted shifter (the same unit as the U.S. Rebel Machine models), center console with locking compartment (also shared with the Rebel Machine), individual high-back bucket seats (shared with the VAM Javelin), bright trim for pedals, heater, AM/FM stereo radio with four speakers, tinted windshield, and a remote controlled driver's side remote mirror. Despite the marketing and high level of equipment, the public saw it as the previous model. The only external differences with the previous model were limited to the colors, the grille, the standard vinyl roof and the wheel covers. The price was higher than that of the Rambler Classic SST and it did not increase sales for the year, ending below VAM's expectations. The VAM Classic Brougham is the closest Mexican equivalent to AMC models Rebel Machine and Matador Machine sold in the U.S. and Canada and is probably the most collectible Matador/Rebel model produced in Mexico. Because of the low sales of the Classic Brougham hardtop, the Classic DPL four-door sedan became the only Matador version produced by VAM for 1973, with Javelin being the largest two-door model offered by the company. The 1973 Classic DPLs were virtually the same to their previous year's counterparts with differences only in seat and side panel designs as well as the grille design and a new engine head with larger valves and independent rockers. The generational change that AMC Matadors received for 1974 in the United States was also introduced in Mexico. The Classic DPL obtained the longer "coffin nose" front clip design complete with the change from dual headlights to single units, grille-mounted parking lights as well as five-mile-per-hour bumpers with standard bumper guards. The rear licence plate was relocated to the center of the rear panel and obtained new longer rectangular taillights. The interior saw the all-new padded dashboard with three squared pods for instruments (emergency lights, gasoline level and water temperature to the left, 200 km/h (120 mph) speedometer at the center and the electric clock on the right) and a horizontal radio design. Seats and interior door panels were once again redesigned. Units ordered with the automatic transmission also included power steering and a heater. The beginning of automotive engine emission certification in Mexico affected the 282 cu in (4.6 L) six, which changed to a lower 8.5:1 compression ratio. The biggest news of the year was the arrival or a new two-door model, AMC's Matador coupe. Unlike all previous (Matador and Rebel) models, it was available in two different trim levels; the sporty Classic AMX equivalent to the AMC Matador X model and the luxury Classic Brougham equivalent to the AMC Matador Brougham coupe model. Both versions were mechanically the same, carrying the same technical specifications as the Classic DPL models. Their main differences relied in appearance and accessories. The Classic AMX sported VAM's in-house five-spoke wheels with volcano center caps and trim rings, a blacked out grille and a rally stripe surrounding the full length of the car with an integrated AMX emblem on the right corner of the trunk lid; the Classic Brougham had a standard vinyl roof cover with its respective moldings, wheel covers (new design for the year), standard grille and "Brougham" emblems over the C-pillar bases. The Classic AMX showcased a three-arm spoked sports steering wheel, high-back fold-down individual bucket seats, center console with locking compartment, floor-mounted gearshift, and AM/FM radio. Despite the sportiness of the model, intended to take the place of the Javelin as VAM's top-of-the-line performance model as well as the image and enthusiast builder, the side armrests were the standard designs used in the Matador base models of the U.S. On the other hand, the Classic Brougham sported a custom sports steering wheel and column-mounted shifter with a fold-down split-back bench seat and AM radio. Unlike the Classic DPL, both the Classic AMX and the Classic Brougham included the automatic transmission, power steering and heater as standard equipment. A unique characteristic of the 1974 VAM Classic AMX was the shifter because it was the Javelin's "aircraft" U-shaped design. For 1975, changes on all three versions were few. The Classic DPL obtained a new grille design with rectangular parking lights alongside new seats and door panels. The luxury steering wheel obtained a new design for the both Classic DPL and the Classic Brougham. Both coupe models obtained new interior door panels with AMC's full-length X-model side armrests; the panels of the sports version also carried an etched "AMX" emblem over the vinyl near the top front corner of the door. The Classic AMX also featured AMC's X-model floor-mounted shifter design. All three versions shared the upgrades of electronic ignition, a vacuum gauge in place of the electric clock, a 282 cu in (4.6 L) I6 with a lower 7.7:1 compression ratio, and Holley 2300 two-barrel carburetor. The rear differential gear ratio was changed to 3.31:1 for both transmissions. There were more changes for the 1976 model year. The Classic DPL and Brougham featured a new design for wheel covers. Both coupe models obtained a new grille design divided in two portions with squared parking lights. The Classic AMX had a new and more discreet side decal covering only the front fenders and a new metal "AMX" emblem on the trunk lid corner. All three versions shared a new 160 km/h speedometer, tinted windshield, and seat designs that were based in AMC's Oleg Cassini units for the Matador coupes. These were color-keyed with the rest of the interior, the most unusual ones were those of the AMX as they were individual and included adjustable headrests with integrated Cassini crests and reclining mechanism. This is the only case of a VAM car close to the various U.S. AMC designer cars. The Classic line was discontinued in the middle of the 1976 model year. VAM was looking forward to introducing the Pacer model to Mexican market, which would represent its fourth product line, while Mexican legislation at the time allowed only three per marque. Having both the Classic and the Pacer in the luxury market segment would have also caused internal competition. VAM favored the new Pacer over what until that time had been its flagship model. Starting in 1977, VAM's most luxurious model was the Pacer, and its largest sized models were the Americans (AMC Hornets). The Rambler name was used on right hand drive Matador models sold in the UK. Matador sedans were available through Rambler Motors (A.M.C) Limited in London alongside the Ambassador hardtop and station wagon, and Javelin. With the exception of the Javelin, Matadors and Ambassadors were exported from Kenosha with factory right-hand drive, as had been with the prior Rebel and Ambassador models brought into the U.K. Unlike the Knock-down kits used for Australian assembly which continued to use the 1967 Weather Eye, albeit to the right of the cluster for the second generation models, U.K second generation Matadors were assembled with the temperature controls of the U.S models (positioned underneath and to the left of the instrument dials.) U.K models also received a locally built and fitted "walnut burr" fascia that replaced the AMC black plastic cluster surround, as had been the practice for previous U.K-market Rebels and Ambassadors. The final 1977 models for the U.K market were regular LHD versions. During the late 1970s, the domestic automobile market was moving to smaller cars. The large-sized Matador was no longer attractive to customers demanding more economical cars as fuel and money became increasingly worrisome problems after the 1973 oil crisis and the continuing double-digit domestic inflation. 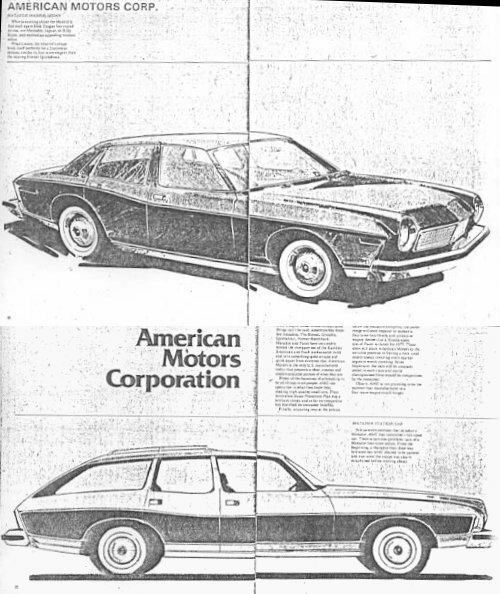 Lacking the financial resources for a full redesign, AMC dropped the large Ambassador after 1974, while the Matador was discontinued after 1978, around the same time as Ford moved their full-size nameplates to a smaller platform. The downsized 1977 Chevrolet Impala also spelled doom for large intermediates from AMC and Chrysler. American Motors responded to the declining demand for large cars by introducing a new nameplate in 1978, the AMC Concord. The Concord was an upmarket restyling and positioning of the compact AMC Hornet which had the same 108-inch (2,743 mm) wheelbase as the redesigned intermediate 1978 Chevrolet Malibu. It was presented as combining an "easy-to-handle size with a roomy sumptuous interior" and in contrast to the Matador coupe, the "overall styling was pleasant ... would not offend anyone" This was the first full-line of economical, compact-sized cars with luxurious trim, features, and comfort levels previously available only in larger automobiles. American Motors did not have another large car until the Eagle Premier that was developed with Renault's partnership and introduced to the marketplace following the purchase of AMC by Chrysler in 1987. While well-restored examples of Matador sedans can still be purchased for under US$3,000, ads have been published asking over US$10,000 for restored coupes. In Australia, a "survivor" or restored Matador sedan can fetch between AU$10,000–14,000. Hemmings Classic Car magazine listed the 1974–78 Matador Coupe as one of their 19 pieces of rolling proof that the old-car hobby need not be expensive and described the Coupe as "possibly one of the most distinctive shapes to come out of the 1970s, and arguably a style pinnacle for the personal luxury movement", the James Bond movie role, as well as its NASCAR history. The 1991 Esquire article "Cool Cars Nobody Wants" describes the 1974–75 AMC Matadors as a collectable, stating: "long considered the automaker to geeks, American Motors began its slow decline, we believe, when the liberal do-gooders who made up its core market began earning enough money to buy Scandinavian cars." In 2014, Hagerty collector insurance listed the Adam 12 AMC Matador as their number one "favorite full-size, rear-wheel-drive American cop cars from 60 years of the best cop shows." ^ "1974 American Motors Matador sales brochure". lov2xlr8.no. Retrieved 8 October 2015. ^ "AMC's Foreign Americans: The Mexican Connection". javelinamx. 28 May 2009. Archived from the original on 21 May 2011. Retrieved 8 October 2015. ^ a b Auto Editors of Consumer Guide (26 October 2007). "1974–1978 AMC Matador". howstuffworks.com. Retrieved 30 November 2013. ^ Flory, J. Kelly (2004). American Cars, 1960–1972: Every Model, Year by Year. McFarland. p. 786. ISBN 978-0-7864-1273-0. ^ The Auto Editors of Consumer Guide (2005). History of the American Auto. Publications International. p. 462. ISBN 978-0-7853-9874-5. ^ Marquez, Edrie J. (1988). Amazing AMC Muscle: Complete Development and Racing History of the Cars from American Motors. Motorbooks International. ISBN 978-0-87938-300-8. ^ Hartford, Bill (October 1973). "Something olé, something new from AMC!". Popular Mechanics. 140 (4): 114. Retrieved 30 November 2013. ^ a b "Autos: American's Moment of Truth". Time. 26 October 1970. Retrieved 30 November 2013. ^ a b Kibbe, Robert (2 March 2011). "Muscle Cars You Should Know: '71 AMC Matador Machine 401". Street Legal TV. Retrieved 12 April 2014. ^ Stakes, Eddie. "Matador Machine - 1971 from American Motors". Retrieved 30 November 2013. ^ Mitchell, Larry G. (2000). AMC Muscle Cars. MotorBooks/MBI Publishing. p. 104. ISBN 978-0-7603-0761-8. Retrieved 30 November 2013. ^ Boone, Louis E.; Kurtz, David L. (1976). Contemporary Business. Dryden Press. pp. 223–224. ISBN 978-0-03-013651-1. ^ Lund, Robert (October 1971). "AMC Gets It Together". Popular Mechanics. 136 (4): 116–206. Retrieved 30 November 2013. ^ a b c "1973 AMC Full Line brochure". oldcarbrochures.com. pp. 30–33. Retrieved 14 September 2015. ^ "Mark Donahue". Motorsports Unplugged. 2011. Archived from the original on 11 January 2016. Retrieved 14 September 2015. ^ "Mark Donahue". Getty Images. Retrieved 14 September 2015. ^ "Year-by-Year Highlights: 1965 - 2012". Team Penske. Retrieved 14 September 2015. ^ Lamm, Michael (May 1973). "It's strong and agile, but thirsty Matador". Popular Mechanics. 139 (5): 132–135. Retrieved 14 September 2015. ^ Severson, Aaron (25 December 2009). "What's a Matador? The AMC Matador, Rebel, and Classic". Retrieved 14 September 2015. ^ Voderman, Don; Norbye, Jan P. "A Critical Look at the 1973 American Cars". Automobile Quarterly. 10 (4): 342. Retrieved 14 September 2015. ^ Norbye, Jan P. (October 1973). "New bumpers have uniform height, take angle impacts". Popular Science. 203 (4): 90–91. Retrieved 30 November 2013. ^ a b c Strohl, Daniel (July 2008). "Bullfighters with Bucket Seats". Hemmings Classic Car. Retrieved 30 November 2013. ^ "1974 AMC full-line brochure". oldcarbrochures.org. p. 13. Archived from the original on 11 January 2016. Retrieved 8 October 2015. ^ Hyde, Charles K. (2009). Storied independent automakers: Nash, Hudson, and American Motors. Wayne State University Press. p. 216. ISBN 978-0-8143-3446-1. Retrieved 30 November 2013. ^ Lamm, Michael (October 1974). "AMC polishes its petrol pinchers". Popular Mechanics. 142 (4): 105, 176. Retrieved 30 November 2013. ^ "1975 AMC full-line brochure". oldcarbrochures.org. p. 42. Archived from the original on 11 January 2016. Retrieved 8 October 2015. ^ "1976 AMC full-line brochure". oldcarbrochures.org. p. 21. Archived from the original on 27 February 2014. Retrieved 8 October 2015. ^ a b Foster, Patrick (December 1996). "AMC Matador Coupe. Kenosha's Question Marque". Collectible Automobile: 51–58. ^ Jedlicka, Dan (2 January 2000). "Matador: bumper-to-bumper style". Chicago Sun-Times. Archived from the original on 2 November 2012. Retrieved 30 November 2013. ^ Lamm, Michael (April 1974). "Styling is a knockout, but so is the low roofline!". Popular Mechanics. 141 (4): 98–101. Retrieved 30 November 2013. ^ Bond, Craig. "Matador Coupe History 1974–1978". matadorcoupe.com. Archived from the original on 17 October 2013. Retrieved 30 November 2013. ^ "American Motors Corporation". matadorcoupe.com. Archived from the original on 29 February 2012. Retrieved 30 November 2013. ^ Cassini, Oleg (1995). A thousand days of magic: dressing Jacqueline Kennedy for the White House. Rizzoli International. ISBN 978-0-8478-1900-3. ^ Hartford, Bill (October 1973). "Something ole, something new from AMC!". Popular Mechanics. 140 (4): 114. Retrieved 30 November 2013. ^ a b "Oleg Cassini put his special touch to the newest design in automobiles introduced for 1974". Archived from the original on 18 November 2007. Retrieved 30 November 2013. ^ Hall, Bob (August 1977). "AMC Matador Barcelona II". Motor Trend: 107–110. ^ a b Riggs, D. Randy (1996). Flat-out racing: an insider's look at the world of stock cars. New York: MetroBooks. p. 140. ISBN 978-1-56799-165-9. ^ Falk, Duane (2000). The Winston Cup: The Modern Age of Stock Car Racing. New York: MetroBooks. p. 42. ISBN 978-1-56799-834-4. ^ Coulter, Bill (1998). Build and Detailing Scale Model Stock Cars. Kalmbach Publishers. p. 63. ISBN 9780890242858. Retrieved 30 November 2013. ^ Bongard, Tim; Coulter, Robert (2001). Richard Petty: The Cars of the King. Sports Publishing. p. 86. ISBN 978-1-58261-317-8. Retrieved 30 November 2013. ^ Mederle, Wolfgang A. (18 April 2010). "AMC History - the 70s". Retrieved 30 November 2013. ^ McTaggart, Bryan (24 June 2015). "Historical Footage: Richard Petty's Charger Vs. Bobby Allison's AMC Matador At The 1975 Southern 500". Bang Shift. Retrieved 8 October 2015. ^ Strohl, Daniel (2 February 2010). "Hemmings Find of the Day – 1973 AMC Matador cop car (Anarchy!!!)". Hemmings Motor News. Retrieved 20 December 2013. ^ Jenkins, Austin (26 June 2006). "NW Troopers Slide Behind the Wheel of a Re-Made 1960s Muscle". KUOW-FM. Archived from the original on 4 August 2012. Retrieved 5 July 2010. ^ Redgap, Curtis. "AMC squad cars". allpar com. Retrieved 20 December 2013. ^ Gunnell, John (2006). Standard Catalog of American Muscle Cars 1960–1972. Krause Publications. p. 8. ISBN 978-0-89689-433-4. ^ "Sketchbook '77". Road Test. Quinn Publications. 12: 39. 1976. Retrieved 20 December 2013. ^ Peters, Eric (2011). Road hogs: Detroit's big, beautiful luxury performance cars of the 1960s. Motorbooks. p. 99. ISBN 9780760333884. Retrieved 30 November 2013. ^ "1974 AMC Matador Coupe in The Man with the Golden Gun". Internet Movie Cars Database. Retrieved 30 November 2013. ^ a b c "Trivia for The Man with the Golden Gun". The Internet Movie Database. Retrieved 30 November 2013. ^ Tannert, Chuck. "Top 10: getaway cars (AMC Matador in The Man with the Golden Gun)". MSN Autos. Retrieved 30 November 2013. ^ a b "A Chronological History of the James Bond Film Vehicles #6. Flying Cars in The Man with the Golden Gun". www.carenthusiast.com. Retrieved 30 November 2013. ^ Green, George W. (2003). Special use vehicles : an illustrated history of unconventional cars and trucks wordwide. McFarland. p. 176. ISBN 9780786429110. Retrieved 30 November 2013. ^ Davis, Pedr (1986). The Macquarie Dictionary of Motoring. Sydney. p. 14. ISBN 978-0-949757-35-7. ^ The Red Book Used Car Price Guide. National Auto Market Research. November 1985. p. 115. ^ Atkinson, Tony. "Australian Motor Industries (AMI) The Start". Australia: hudson-amc.org.au. Retrieved 26 January 2014. ^ "From The Classifieds: 1978 Rambler Matador coupe". Australia: motoring.com.au. Retrieved 26 January 2014. ^ "The Red Book Used Car Price Guide - 1971 Rambler Matador (Nov)". Redbook.com.au. Retrieved 8 October 2015. ^ "AMI AMC Rambler History, facts, figures, photos". 15 February 2013. Retrieved 25 January 2015. ^ "Sue & Greg Palumbo's 1972 Rambler Matador". Hudson-AMC Car Club of Australia. Retrieved 26 January 2014. ^ Roberts, Graeme. "AMC/Rambler Australia information". allpar com. Retrieved 30 November 2013. ^ Cranswick, Marc (2011). The Cars of American Motors: An Illustrated History. McFarland. p. 219. ISBN 9780786485703. Retrieved 25 January 2015. ^ Green Book Price & Model Guide. Blackburn South, Victoria: MW Publishing. March – April 1984. p. 72. ^ "Jamal's 1976 Matador X Coupe". Hudson-AMC Car Club of Australia. Retrieved 26 January 2014. ^ "head in the hive" (9 June 2013). "1974 Matador X Coupe". flickr. Retrieved 26 January 2014. ^ Wilson, Bob. "Arcticboy's VAM Pages". arcticboy. Retrieved 30 November 2013. ^ a b Mauricio Jordán (22 November 2009). "The AMX in Mexico - Alternative Performance". The AMC Forum. Retrieved 30 November 2013. ^ Cranswick, Marc (2012). The Cars of American Motors: An Illustrated History. McFarland. p. 202. ISBN 978-0-7864-4672-8. Retrieved 30 November 2013. ^ Hayward, David O. "Chrysler United Kingdom: A History of Chrysler in Britain". allpar com. Retrieved 30 November 2013. ^ Cranswick, Marc (2011). The Cars of American Motors: An Illustrated History. McFarland. p. 219. ISBN 978-0-7864-4672-8. Retrieved 30 November 2013. ^ Vance, Bill (13 June 2008). "Motoring Memories: AMC Concord, 1978–1983". Autos Canada. Retrieved 30 November 2013. ^ a b Koch, Jeff (January 2008). "Dollar-A-Pound Collectibles". Hemmings Classic Car: 18. ^ Wellikoff, Alan (1991). "Cool Cars Nobody Wants". Esquire. 116: 124. Retrieved 30 November 2013. ^ Sass, Rob (28 February 2014). "Six of the Best TV Cop Cars". Hagerty.com. Retrieved 11 March 2014. Foster, Patrick R. (2004). AMC Cars: 1954–1987, An Illustrated History. Motorbooks International. ISBN 978-1-58388-112-5. Montgomery, Andrew, ed. (2002). The Great Book of American Automobiles. Motorbooks International. ISBN 978-1-84065-478-3. Marquez, Edrie J. (1988). Amazing AMC Muscle: Complete Development and Racing History of the Cars from American Motors. Motorbooks International. ISBN 978-0-87938-300-8. Wikimedia Commons has media related to AMC Matador. AMC Rambler Club — Club for 1954 – 1988 AMCs. American Motors Owners — Club for 1958 – 1988 AMCs.